If you’ve just found out about the earned income tax credit, you may feel like you’ve hit a financial jackpot – especially if you are able to use this tax credit to eliminate your tax bill and get back thousands of dollars from the government. But what you may not know is that you could be entitled to an even larger financial bonanza, and a host of other benefits, all thanks to the EITC. Under the law, if you were eligible to claim the earned income tax credit in the past, but didn’t, you can still get that money. You can file anytime during the year to claim an EITC refund for up to three previous tax years. For some taxpayers, this provision could spell many more thousands of dollars – money that will no doubt come in handy during these trying economic times. If you are receiving public assistance or welfare benefits, you’ll be pleased to know that claiming the earned income credit has no effect on certain forms of aid. For example, getting a refund via the EITC does not impact your eligibility for food stamps, low-income housing, Medicaid and Supplemental Security Income (SSI). EITC payments are not counted as income for these programs. If you live in any of these areas and you qualify for the federal EITC, be sure to also file a similar credit on your state or local income tax return. 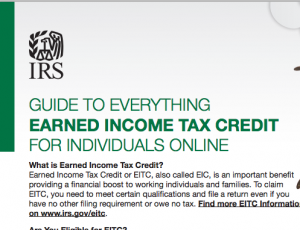 For further information about this topic, read IRS Publication 596, Earned Income Credit.